It’s been a heckuva winter as they say up here in the North Land– one of the longest, coldest, snowiest, grueling and unending we’ve had in years. There were 50 days below zero, wicked windchills that caused kids to miss 6 days of school (usually there are no snow days here), and the cities had to implement a parking ban— only parking on one side of the street because too much snow made the roads too narrow. I know that much of the country had terrible winter stories to tell as well… we were all in it together. 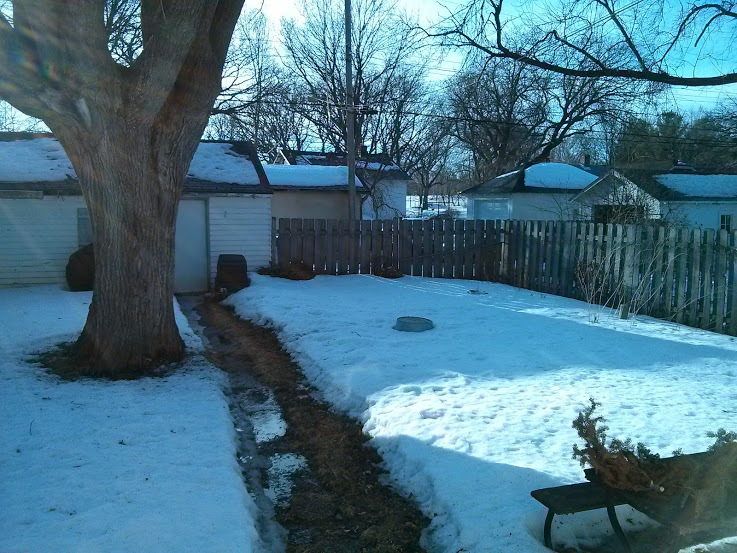 It’s been a rough winter for me in other ways too– my Touch of S.A.D. acts up and I get all depressiony. After a few months out of work, my husband got a job that has great benefits but pays less… so we’re struggling. I quick got a job but it isn’t working out so well– few hours and doesn’t pay much, so I’m continuing to look. We refinanced our house and it didn’t work out the way we wanted it to (at least it’s done and the payment is smaller). We also had the mucho expensive transmission rebuild on our van, followed immediately by needing a new starter. March seems to be interested in being a little kinder to us all. We’ve had a string of temps in the 30s and 40s, which feels like a mini-heatwave this year. We’ve had some great melting going on– but we still have a lot of snow. You can’t tell from these pics, but it’s a major improvement! Lots of puddles, the ice ridges have left the roads, and there’s been more light during the longer days. Before winter leaves for good, I wanted to share one of the bright spots— thank goodness there were many little bright spots during this tough season, sprinkled in here and there to help get us through. This one is as simple as a piece of polar fleece– I discovered that apparently I have a Magical Scarf. Really! Who would’ve thought you could just buy a Magical Scarf from Target? Truthfully, it doesn’t have much in the way of magical qualities (not yet, I’m still holding out hope). But it’s earned this new title just because it happens to be the Most Complimented Piece of Clothing I Own. So what, you say? A few compliments, big deal? Honestly, this scarf gets a ridiculous amount of compliments. Everybody loves this scarf and wants to tell me so– which is very nice! 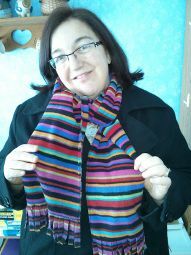 Yes, it’s a pretty, bright stripey-soft scarf. I bought it on a whim many years ago, and it’s held up well. Is it just an eye-catching pattern? Is it the recent popularity of rainbows? I don’t know. But for now I’ll think of it as my Magical Scarf… just because it makes me smile, and now I giggle when the scarf gets some adoration from one of its many admirers. Maybe it’s just a little bit of beauty that brightens someone’s day in a dreary winter. And maybe that’s just the kind of magic we need most days. Lovely, Theresa! Now, I know that scarf and it’s history with one of my favorite people. I think these things come to us when we need them… and you followed through when it spoke to you all those years ago, even if it felt like just a whim. Being an intuition geek, I’d say yours is with you and wanting to help especially now.